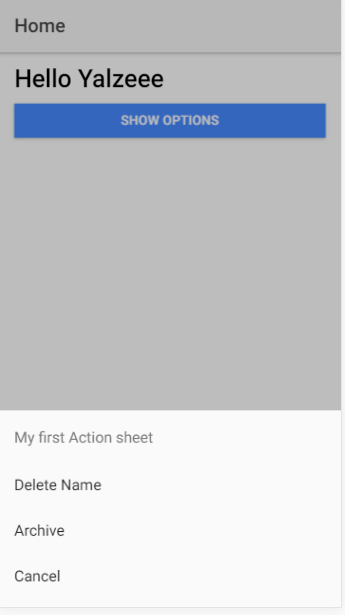 In this tutorial i would be covering the Alert and Action Sheet components which are components of ionic which you would almost certainly use during your development. In this tutorial i would try to make understanding the use of this as easy as possible so you would be using this in you applications in no time. 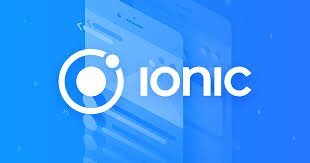 These like all other elements we use in ionic are component which have been developed as part of the core framework. Lets get to how to use them. Alert are pop-up that are present in almost all applications and for ionic we have about 6 alert types. They have a few modifications you can make to which ever you would like to use and it would display on the template whenever triggered by an event. You should note however that ionic alerts are not native,meaning that they are like modified components not the inbuilt alerts that come with ionic. However if you would choose to use the native, you would download the cordova plugin for this. We would be creating an alert that prompts the user for data and passes that data for us to use. This would seem to be a challenge to junior developers as this not clearly stated in the documentation. When all dependencies and packages have been installed head to the template file for the home page and use the code explained below. I chose to do a data transfer because nowhere in the documentation did it state it clearly and when i was starting up this was quite a hassle. 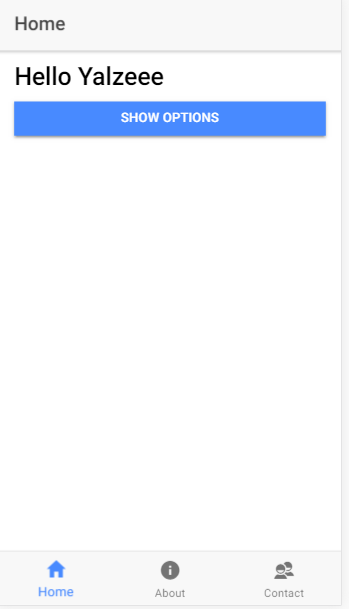 Ionic default action sheets act just like the alerts with the alert controller handles. Action sheets are simple components that pop up to enable us create quick on actions such as deleting a file or playing a file and even modifying it. Rather than using the native action sheets that come with android and ios ionic developed something quick and easy to use. Lets get on to how to use this. We'll also be using our home page for this example and seeing the different types of actions. If you looked through the code you would have noticed that some of the buttons had roles. This are peculiar to action sheets and help identify and modify the button based on use. For instance the button with the role of destructive is for deleting an item. 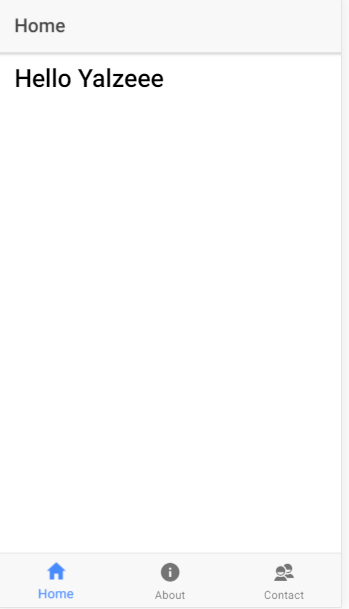 In the template this button is displayed in red text and is displayed at the beginning of the template regardless of where in the array it is placed. Also the cancel button is always at the end of the template. Lets trigger this event from our template and see the effect. 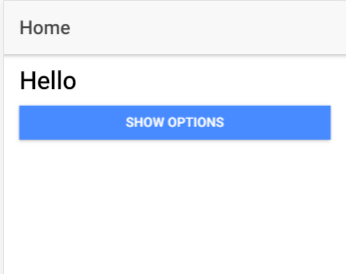 Also when i click the button we can see that it clears the name i previously input. 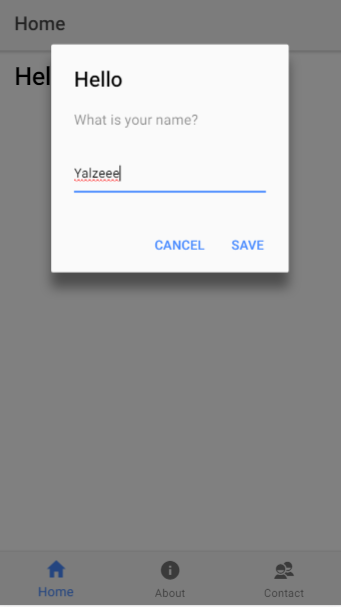 In the examples above i used ionic defaults action sheets and alert. You could also use the native alerts which are inbuilt into android and ios frameworks with ionic. These would require plugins and are a whole different process which i would explain in a different tutorial. Now speaking about the pros and cons or simply the difference between using these. In my opinion, using ionics default would be better because these components are not complex and would not require any extra processing speed. So it would in no way affect the lag of your application. Using native components on the other hand requires the use of plugins which work perfectly fine also when setup for the platform they are to be used on but as always native components are a bit more complex. Thank you for your contribution @yalzeee. Try to improve the structure of your tutorial. For example, in the tutorial and alerts section could be a title so as to create a greater separation over the text of the explanation. Use as title for example <h2>title</h2> tags. It will give a better presentation of the text to the reader. See the template for tutorial here. We hope to see an improvement in structure in your next tutorial. Thank you for your work. Thank you for your review, @portugalcoin! Keep up the good work!